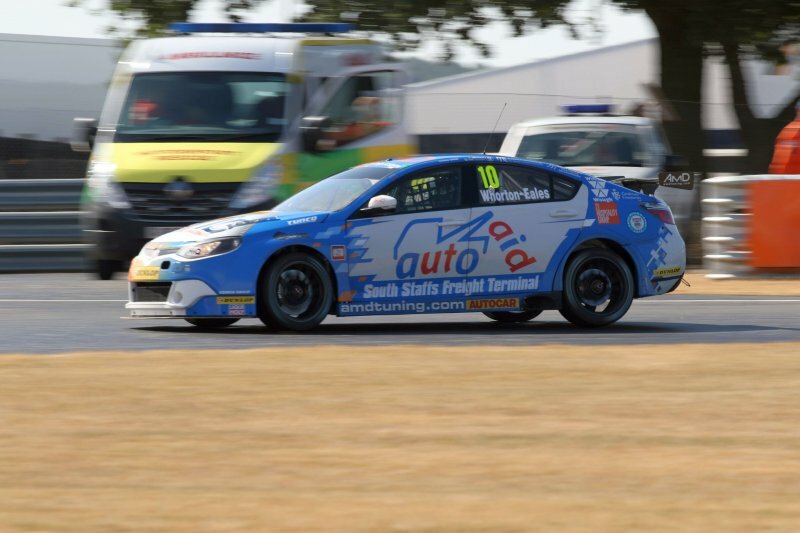 he AmD with AutoAid/RCIB Insurance Racing team salvaged a top ten finish from a tough weekend on track as the Dunlop MSA British Touring Car Championship season resumed at Snetterton. The West Thurrock-based team headed for the Norfolk circuit keen to push for strong points, with regular racer Rory Butcher being joined by Ant Whorton-Eales for the special Diamond Double meeting – which featured an extended third race offering double points. Qualifying saw Fife racer Rory leading the team’s challenge as he put his MG6 GT in 18th place on the grid for the opening race of the weekend before setting the 21st best time in a shorter second session used to determine the grid for race three. A strong opening lap in a wet first race saw Rory rocket up into eleventh spot and it appeared that a good result was on the cards only for alternator failure to suddenly slow the car and force him into retirement. That left Rory near the rear of the field for race two, but he fought hard to make his way through to the fringes of the points before contact on track forced him into an unscheduled pitstop – dropping him off the lead lap and leaving him to finish in 23rd. Eager to try and recover points in race three, Rory’s weekend would unfortunately end in disappointing fashion when he was forced off track on the opening lap of the Diamond Double race and once again failed to make the finish. Team-mate Ant went into the weekend with no prior time at the wheel of the MG6 and carrying 45kg of ballast as a new entry, which played a part in him qualifying 30th for race one. Without ballast in second qualifying, he posted the 29th best time on the grid for race three. A solid opening race saw the Lichfield racer battle his way into the top 20 before late contact caused a puncture that dropped him back down to 23rd place. Race two however in changeable conditions allowed Ant to showcase his talents with a fine drive through the field to take tenth spot and a well-earned points finish. The revised weekend schedule meant no opportunity to benefit from the reverse grid for race three, with Ant instead left to try and carve his way through the field again in the double length finale and having climbed as high as 13th as part of a huge midfield battle, he would end the race just half a second outside the points in 16th place. “It’s been a frustrating weekend for me that promised a lot. In both the wet and mixed conditions we clearly had a quick car but we haven’t been able to bring home the results. In race one, I had a mega start and I’m sure that without the issue that developed, I could have picked off the guys ahead and finished well inside the top ten. “Race two was one of those where there was a lot of contact in the pack and I got caught out by the two cars ahead suddenly braking early into one of the corners and I couldn’t avoid a front-to-rear impact. They happen all the time but unfortunately it dislodged the air intake so I had to pit. “It’s been a really good weekend and I’m really pleased to come away from Snetterton with a points finish. The start of the weekend was a bit of a struggle because of the weight we had to carry and the lack of time in the car, but we kept making improvements and then the conditions worked in our favour on race day. “We had a decent car in the wet in race one but couldn’t get the result because of contact, and in the changing conditions in race two it was great to fight our way through to tenth – it’s just a shame there was no reverse grid this time! “It’s been a weekend of ups and downs for the MGs this weekend. Rory has been extremely unlucky because he had the pace to pick up three strong results on race day and instead has come away with nothing to show for his efforts. Picture thanks to Marc Waller.